Better performance of equities helped the pair bounce, but upside still limited. US employment data could disappoint after the latest correlated releases. 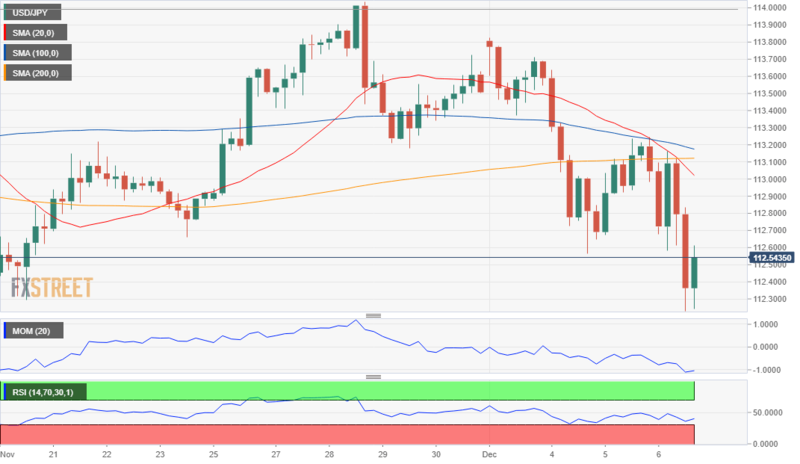 The USD/JPY pair extended its bounce from a fresh 5-week low of 112.22 during Asian trading hours as the equities' sell-off cooled down following a two-day constant bleeding. European indexes are also up but government bond yields remain depressed, with the yield of the 10-year Treasury note now at 2.88%, barely above its weekly low of 2.87%. Softer yields are keeping the pair below 113.00. Japan's Leading Index came in at 100.5 for October, well below the expected 104.8, with September reading downwardly revised to 99.6. The Coincident Index for the same month resulted at 104.5, better than the previous 101.6. Activity is limited ahead of the US employment report to be out later today. The economy is expected to have added 200K new jobs in November while the unemployment rate is expected to have remained unchanged at 3.7%. Average hourly earnings are seen up by 3.1% YoY and by 0.3% MoM. Data ahead of the monthly report has been quite soft, and it shouldn't surprise an outcome below forecasts. The pair is just marginally up daily basis, still bearish in the short term, as, in the 4 hours chart, it is developing below the 100 and 200 SMA, both now converging in the 113.20 price zone. Technical indicators have stalled their recoveries around their midlines, now offering mild bearish slopes. It's all about the employment report and how the market assesses the figures. A strong reading enough to boost equities could push the pair up to the 113.60 price zone, while a disappointing one that spurs concerns could see it breaking through the 112.50/60 support area.